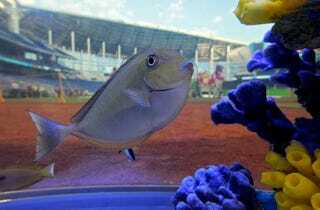 I love me some animal welfare, but can't get too worked up by the Marlins having a tank filled with live fish embedded in the backstop of the new Marlins Park. For one, fish are dumb. For another, the other option, the ocean, is not exactly a paradise. There are predators and seaquakes and boats and the constant struggle for survival, and in the end NL East baseball is maybe not so bad. The New Times Broward-Palm Beach takes the other tack, talking to a spokesman for the Animal Rights Foundation of Florida. "I don't know if its on the high end of animal abuse, I don't know if its going to upset them to the point that it kills them," but pointed out that if fish in somebody's living-room aquarium get startled by one person tapping on the glass, it was a pretty safe bet the fish forever trapped in a colosseum of stomping, screaming, booing fans would be perturbed. Beyond the stadium vibrations, there's always the fear that a batter ball could whack the tank head-on. But don't worry: they've thought of that, stress-testing the glass by "having first-baseman Gaby Sanchez wing baseballs at the thing." Also, setting up a pitching machine to fire balls at it. No shattering, no cracking, just some startled fish. How can you tell they're startled, Marlins VP of ballpark development Claude Delorme? "You would see a small reaction — they would move because they would sense something in that area," he said, adding that while the fish did swim away from the impact spot (pretty much their only way for fish to say they don't like something), they also floated back to their spots afterward. That's a profoundly sad paragraph. Poor fishies.